Are you in search of the best Executive Limo Wedding Car Hire Norfolk and the surrounding areas? Crystal Chauffeurs meets all your limo hire needs in the most professional way. When it comes to finding the best company for limo hire, Lincolnshire, Norfolk and Rutland do offer many options but you will need to screen your limo hire company with great care because not all companies that promise you great service live up to their promise. Don’t worry, Crystal Chauffeurs offers outstanding limo hire services in and around Lincolnshire, Norfolk, Leicestershire, South Yorkshire, Nottinghamshire and Leicestershire. Crystal Chauffeurs makes itself a worthy limo hire company by offering its customers with highly commendable services. You will find our limo hire Lincolnshire services very reliable. As an experienced limo hire company in the region we understand very clearly that every customer that approaches us comes with a unique need and we do our best to cater to everyone’s needs in the most impressive way even if it means going out of our way. For us at Crystal Chauffeurs, customer satisfaction is our top priority. You will just need to name your need and we will take care of the rest. Crystal Chauffeurs offers tailor made limo hire packages that will best fit your requirements. We customise our packages to meet your requirements; after all, we are here to serve your needs. We will ensure that we meet your needs in the best way possible. We take great pride in featuring our large fleet of limos for hire. Unlike some of the service providers that you might have come across, we are not limo brokers but we have our own fleet. This simply means that we have total control over the quality of the limo hire Norfolk services that we offer. Our outstanding fleet will certainly not disappoint you. You are sure to find a vehicle that appeals to your taste and preferences. All our limos are in top-notch condition, regularly serviced and well maintained. You will therefore not run into any glitches when you choose our limo hire service. 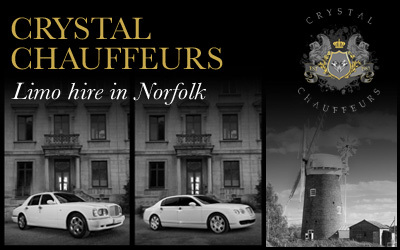 For affordable Executive Limo Wedding Car Hire Norfolk and the surrounding areas contact Crystal Chauffeurs. We make our premium limo hire services easily accessible to everyone through our affordable pricing. You will find our tariffs not only affordable but also transparent and straightforward. No hidden charges or other surprise charges! You will be in total control of the costs. Get in touch with us to get your quote and to book your limo. We keep the entire process very simple and easy. We confirm your booking fast and we will not keep you waiting until the last moment.